Many thanks to all of you expressed your support for Greece after my recent blog post on feminismandreligion.com about the new Greek government, and why I feel its courageous stance against austerity deserves our attention now. If you appreciated that article and would like to share it with friends, a version is available online here. The above quote is from Carol P. Christ’s recent article, The Greek Elections and the 1%, also on feminismandreligion.com. You are welcome to email me for links supporting the other information in this article. Please understand that I am writing in my own voice, based on my firsthand experience of living part-time in Greece since before the crisis. The economic crisis began six years ago when Wall Street ratings agencies suddenly, inexplicably, lowered Greece’s credit rating, which then raised the interest rates on Greek debt – mainly loans taken out for the 2004 Olympic Games. Spiralling payments just to service these debts – not even to pay them off – led the Greek government to accept further huge loans from the IMF, the EU and the ECB - the ‘troika’. However, these new debts – and the extremely harsh austerity measures imposed by the troika along with the loans – only made the problems worse. And the loans benefited only foreign banks and speculators; not one penny of the money went to the Greek people. On the contrary: the economy has contracted to a degree not seen since the war. Government services have been annihilated. Hospitals, schools and universities have been shut down. A quarter of the country is now out of work, and in Greece, no job means no access to health care. Those still with jobs saw their salaries slashed to half or a third of what they had been before and benefits reduced to zero; many employees went for long periods with no pay at all. Pensions were cut by over half, while the cost of living has risen dramatically, with an unending series of new taxes and fees for everything imaginable. Suicide rates have soared, especially among older men, who can not bear the humiliation of no longer being able to provide for their families. Young people, facing an unemploy-ment rate of nearly 60%, are emigrating in droves. Over a third of the population now live in poverty. 300,000 homes are without electricity; many more have no heat. How have people managed to survive this humanitarian crisis? What I see is that the generosity and hospitality which are ancient and sacred traditions in this land, and the extremely high priority placed on the family, means that people here step in to support one another. What little they have, they share. Thus people get by with help from relatives, neighbours, colleagues and friends; thousands are fed in soup kitchens run by churches or charities; and some local LETS systems have flourished, as in Volos. But I also see how people who lived close to the land, supporting themselves and their families sustainably and locally, and those who chose an artistic or alternative lifestyle, content with little money, can no longer live simply and cheaply. To pay an unjust new property tax – your electricity is cut off if you don’t – everyone needs to come up with more cash than before, at a time when it is next to impossible to earn any money. People are selling off valuable possessions and family heirlooms ‘for peanuts’ which are ‘thrown into a black hole of unsustainable debt’ – that’s how the new Greek finance minister, Yanis Varoufakis, describes the country’s debt situation. The same dynamic affects ordinary families. And each month, new bills come and they go through it all over again. People struggling for survival in this way don’t have a lot of energy to focus on restructuring society for positive change. ‘Disaster capitalism’ aims to engineer ever-increasing waves of shock and trauma to keep citizens from responding in an effective way. This policy, undertaken with intent in many countries before being applied to Greece, is what Naomi Klein has named the ‘shock doctrine’, and it is phenomenally successful at transferring state resources into the hands of outside speculators. According to this policy, it would make sense for these outside speculators to use their political, economic, and media influence to provoke a worsening situation in Greece now, risking default, exit from the euro and worse. The greater the instability in a nation, the higher the interest that nation must pay on their loans – and the greater the profit to the world’s wealthy who have ‘invested in’ Greek sovereign debt for their own gain. As Greg Palast points out, many of the ‘vulture capitalists’ who now hold Greek debt bought it for a fraction of its face value, yet demand that Greece pay back the full amount. As I see it, the danger now is not only to Greece and the Greek people, nor the other European citizens who are next in line for brutal austerity. The real danger is to the values of community and partnership, sustainability and mutual support which still survive here in people’s hearts, homes and daily lives. These are exactly the values which we all need to cultivate and strengthen if we are to survive as a human family on planet earth. This is why I believe the Greek situation affects all of us, and why I feel it is important to express our solidarity with Greece’s peaceful and democratic bid to end an inhumane and punitive economic regime. Now is a crucial time to send our prayers, to show support, and to help reclaim dignity, hope and a sustainable path for our shared future. Please pray for Greece – and visit this year, if you can. Your support means a lot. Ten years ago, I went to live in Greece. I knew I would love living in a culture where everyone dances, and so it turned out. 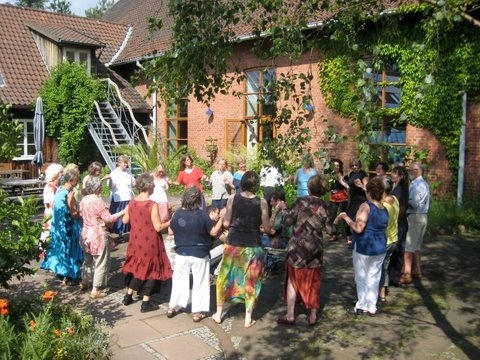 I also loved the generosity, hospitality, connection, mutual support, and positivity embodied by the dance, a set of values which goes back thousands of years to Old European culture as articulated by Marija Gimbutas, Carol P. Christ, and Riane Eisler. When the economic crisis struck in 2008, I saw firsthand how Greek people used these values to help each other survive. On Sunday, Jan 25th, 2015, the Greek people decisively voted into power the anti-austerity party Syriza (SEE-rih-zah), after six years of intense suffering under brutal austerity measures imposed by the IMF, the EU and the European Central Bank. 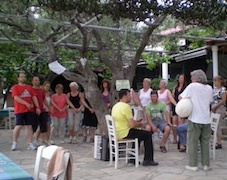 In the last week of May I took a little vacation to be a participant for once, in the annual seminar of Greek traditional dances led by Babis Almpantis and Dimitris Pashalides on the lovely island of Thassos. I had been very impressed by 'O Kyklos tis Zois', the beautiful and moving performance by Babis' and Dimitris' dance groups in Ettlingen Concert Hall in February. 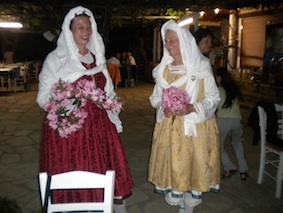 Their choice of authentic village dances and songs was exactly to my taste, so I knew I wanted to come to Thassos to dance with them some more. Thassos is an exquisitely beautiful little island, known since antiquity as the Emerald of the Aegean. Abundant water and varied forests give it a lushness and beauty very different from the dry, austere beauty typical of most Greek islands. At Aliki where we danced under the shade of olive trees, there are quiet beaches and calm bays as well as archaeological sites including temple ruins, ancient marble quarries and an early Christian basilica, all overlooked by Mount Athos across the water. 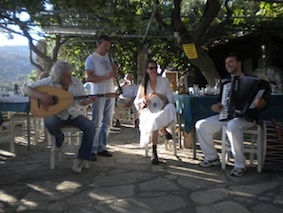 We had the blessing of live music every day and night, with Panayiotis Zikidis and other members of Methorios. 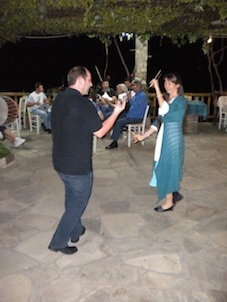 Other musicians dropped by regularly, both locals and friends from Thrace and Macedonia, so it was really a feast of music and dance. Babis' teaching is a delightful combination of crystal-clear authenticity and playful humour, wonderfully supported by Dimitris and Natassa, outstanding dancers as well as beacons of good cheer. It was a beautiful week of nonstop dancing and laughing, flawlessly organised by an experienced team. I will be glad to see you there! A lifetime of research has convinced me that the women’s ritual dances and costumes of Greece are living remnants of ancient Old European Goddess traditions. In previous posts on FAR I have written about these dances and embroideries, as well as the Midwives’ day rituals which honour the wise women, and the healing effects the women’s circle dances can have. All of these threads came together again in my most recent trip to Thrace. Today trisected into Greek, Bulgarian and Turkish parts, Thrace is a wild landscape of mountains, forests, rivers and fertile fields. Less than one hundred years ago Greeks, Slavs, Turks, Pomaks, Gagaouzides and other ethnic groups lived and mingled freely throughout the whole area, and although the traumatic wars of the 20th century precipitated a huge upheaval of refugee movement and new settlement, Thrace is still home to a great variety of different peoples here who have kept their customs alive. In Greece, Thrace is the most northeasterly region, and Evros is the very topmost bit of it, rising up like a thumb between Turkey and Bulgaria. I started visiting the villages of Evros some years ago and have been back many times. When friends invited me to celebrate my birthday there recently I jumped at the chance. All the villages we went to are Greek Orthodox, with visible elements in costume and culture – such as the Goddess embroideries – which survive from pre-Christian times. From 10-13 June, we had the first dance and singing festival in Lebensgarten, Germany, with Kyriakos Moisidis, Laura and Brigitte Schmitz. Brigitte's lovely singing brought everyone into the group and provided a perfect starting place for the traditional dances. We were blessed with live music from four outstanding Greek musicians: Kostantis Kourmadias, Panagiotis Zikidis, Yiorgos Ntavliakos and Katerina Douka. It felt very special, at this time of great conflict and frustration between Germany and Greece on the world economic and political stage, to come together in the joyful healing oasis of music, dance and song which unite us all. 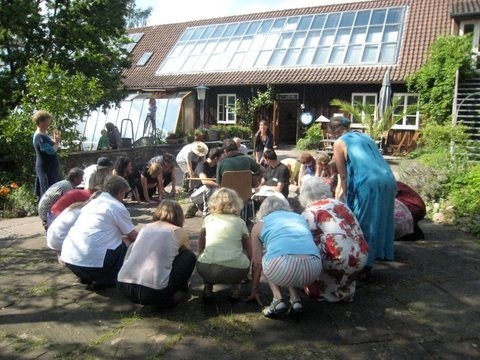 In 2012 the Festival will be in Lebensgarten again and will continue alternating between northern and southern Germany as a collaboration between Declan Kennedy of Lebensgarten and Beate Frey of Heilung-und-Tanz in Bad Herrenalb.